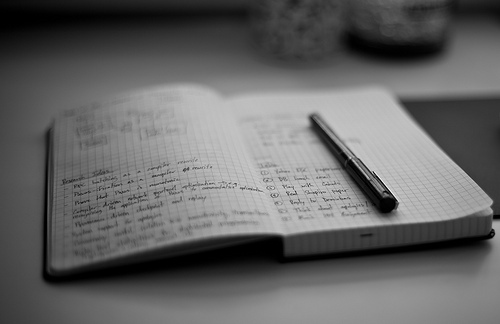 Why might you wish to keep a scientific notebook? To provide yourself with a complete record of why experiments were initiated and how they were performed. To give yourself a centralized, physical location in which to record your investigations. To provide information to a person who is interested in continuing your research project. Document one’s own observations of and experiences in the world. Capture the beauty and wonder–but also the problems and dangers–found in the world. Develop and hone observation skills, including writing, drawing, and sketching. Become familiar with scientific practices such as analysis, application, argumentation, inference, deduction, organization, and persuasion. Become familiar with scientific virtues such as creativity, invention, objectivity, patience, and novelty. Become familiar with scientific values such as accuracy, generality, precision, reliability, repeatability, testability, and simplicity. Examine, reflect, question, link, probe, and/or connect one’s ideas. Practice the art of inventing new questions. Overlay and/or integrate one’s previous knowledge to new observations and experiences. Capture both the exquisite and mundane moments of experience. Develop and hone an awareness of how professional scientists create scientific facts, knowledge, understanding, and truth.